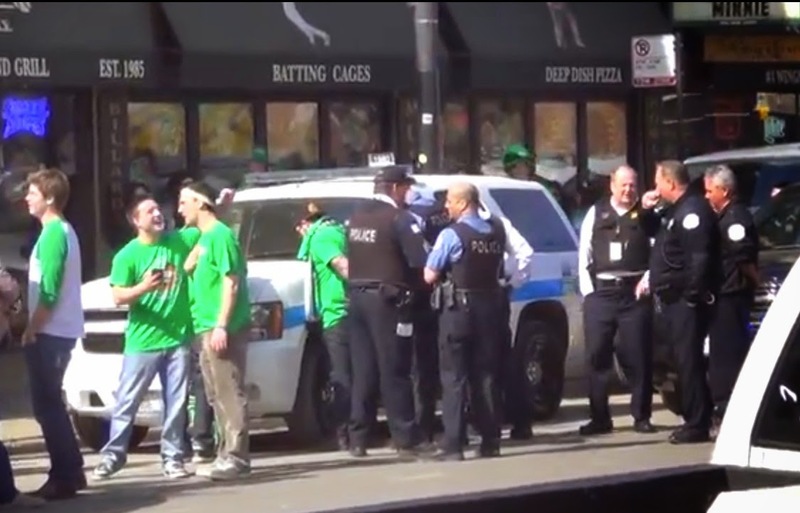 The annual disaster called "St. Patrick's Day" in Wrigleyville is underway—and the skids are well-greased for what could become an epic sh!tshow. The warm weather is drawing crowds bigger and earlier than last year. And, while Alderman Tom Tunney told constituents yesterday that he had, "met with our police to develop an overall public safety plan for our neighborhood" ahead of today's events, those plans apparently do not include one of the most basic steps: No barricades have been placed along Clark Street to keep bar-goers out of traffic lanes. Police have already made the first arrest of the day, locking a man up for allegedly battering a police officer outside of Slugger's bar at 12:21PM. Day shift police officers are being ordered to stay on duty past the scheduled end of their shifts to handle the affairs on Clark. We will have a full report on today's events early Sunday morning.